My great-great-grandfather Bernard Seligman was born on November 23, 1837 in Gau-Algesheim, Germany. When I learned about the small town in Germany where my great-great-grandfather Bernard Seligman was born, I was not surprised that he had decided to move away when he reached adulthood. Gau-Algesheim was itself a very small town, and the Jewish population was tiny—perhaps 60-80 people during the 1840s and 1850s when Bernard was growing up. The opportunities for a young Jewish man must have been very limited—socially and economically. My research of the town indicated that by 1900 the Jewish population had declined dramatically. My great-great-grandfather and his brothers were therefore not unlike many others who moved out of their small hometown to seek greater opportunities. Before leaving Germany, Bernard received what was described as a “first class education in the public and commercial schools of his native land where he also gained considerable actual business experience while employed a wholesale establishment there.” According to a book written in 1925 by Ralph Emerson Twitchell, then the official state historian for New Mexico, Bernard Seligman had been associated with the Rothschild banking house in Frankfort-on-the-Main before coming to the US. 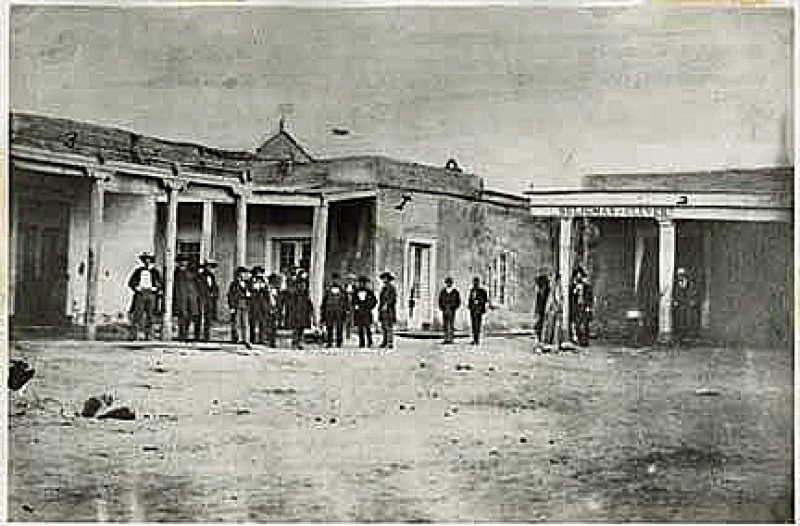 This photo is claimed to be the oldest photograph of Santa Fe, taken about 1855. You can see the sign for Seligman and Clever on the right. At one time one of the streets in this photograph was called Seligman Street. When Sigmund’s partner Charles Clever resigned from the business a few years later to become a lawyer, Bernard became a partner with his brother Sigmund in the business, and it was renamed S. Seligman and Bro. Some years later a third brother, Adolph, born in 1845, also settled in Santa Fe and joined his brothers’ business in the 1860s. As described by William J. Parish in “The German Jew and the Commercial Revolution in Territorial New Mexico 1850-1900,” New Mexico Historical Review, Vol. 35, p. 1 (1960), until the arrival of Jewish German immigrants like the Seligmans, the trade conditions in the New Mexico territory were quite rudimentary, a few small stands relying upon traveling merchants to provide them with merchandise. According to Parish, heavy taxes and the high cost and risk of travel made many reluctant to deal in the region. Storekeepers could not rely on these traveling merchants to supply an adequate inventory of goods. Thus, few merchants established permanent roots in the area. These conditions provided a substantial opportunity for Jewish German immigrants like my ancestors, the Seligmans. 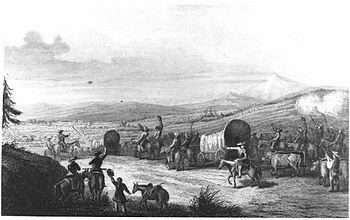 Beginning in the 1840s around the time that Sigmund immigrated, there were a number of recent Jewish German immigrants who brought a thriving economic base to Santa Fe and other New Mexican cities based on transporting goods from the eastern United States over the Santa Fe trail to the New Mexican territory recently acquired by the US after the Mexican War ended. As postulated by Parish, German Jews came to the US with a particularly good background to take advantage of these entrepreneurial opportunities. Parish discusses how historically Jews in Western Europe, although foreclosed from entering many trades, had been allowed to take on the role of the moneylender, a livelihood to which Christians had an aversion and, in some cases, a religious opposition, thus leaving that unpopular job for their Jewish neighbors. Although this created some hostility and resentment (as seen, of course, in The Merchant of Venice and the character of Shylock), it also provided Jewish men with the opportunity to develop skills in banking, business, and capitalism. Jewish immigrants brought these skills with them to the US wherever they settled, and, as Parish points out, those who came to New Mexico had a profound impact on the fledgling economy that existed there. 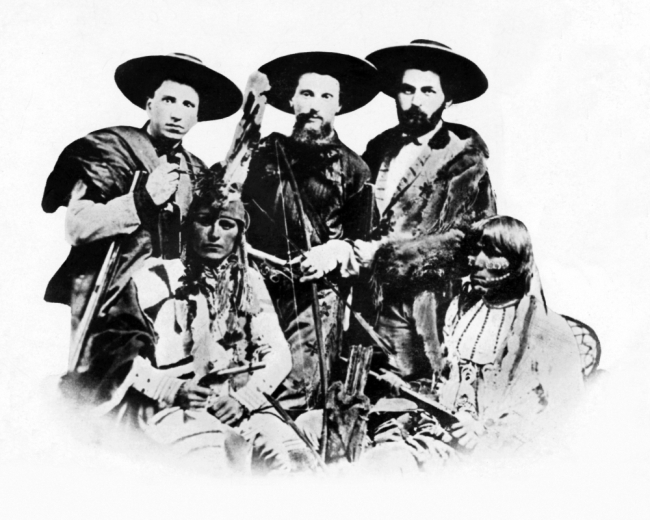 This is a photograph of my great-great-grandfather Bernard Seligman (far left) with two other Santa Fe merchants, Zadoc Staab and Lehman Spiegelberg, and two Kiowa Indian scouts. 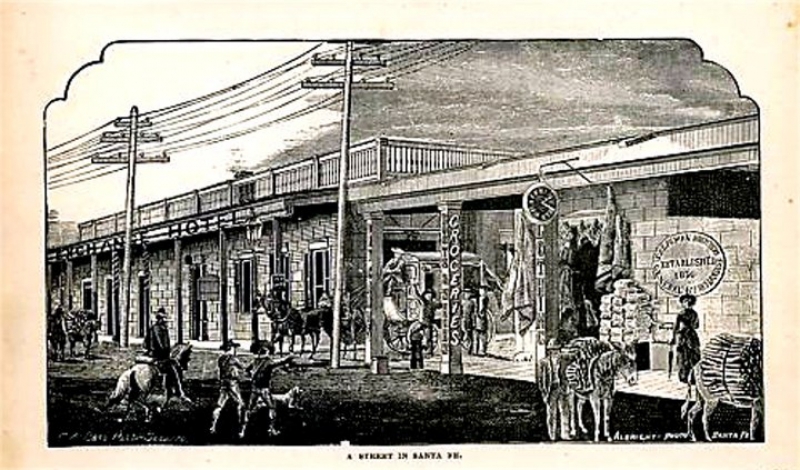 The growth of the economy is illustrated by the growth in the number of Jewish merchants in Santa Fe from 1850 to 1870. In 1850 there were eight such merchants; by 1860 that number had doubled to sixteen. By 1870 it had doubled again to 32; clearly, my relatives had arrived at the right place at the right time. These merchants were not transient traveling merchants. They established permanent businesses and stayed in the community. Thus, by the 1860s, the Seligman Brothers’ business was thriving. They and the other Jewish merchants had brought a reliable source of goods to Santa Fe for the first time. These merchants, however, were not involved in any of the traditional practices of Jewish life. According to Henry J. Tobias, the author of The History of the Jews in New Mexico, although these men identified as Jews, there was no evidence of any regular Jewish observance in Santa Fe during those early days—no evidence of a synagogue or any form community prayer or celebration, no observance of dietary laws. The Jewish population was less than five percent of one percent of the overall population at that time, and the Jews had to adapt to living in a culture where they were such a tiny segment of the community. Most of the Jewish residents in the 1860s were single men, although a few women and families were starting to arrive. In 1860 there was a celebration of Yom Kippur at the home of Levi Spiegelberg, another Jewish merchant, who had recently married a Jewish woman from Germany. Tobias speculated that perhaps the arrival of Spiegelberg’s bride, one of only two Jewish women in the town at that time, made the others nostalgic for the traditions from back home and thus inspired this day long observance of fasting and prayer. After the Civil War and after his younger brother Adolph had arrived in Santa Fe, Bernard moved back east to Philadelphia for several years. Parish pointed out that there were no Jewish single women in Santa Fe in the 1850s and 1860s, and that while some Jewish men intermarried, most went back east to find a Jewish woman to marry. Sigmund never married, and Adolph did not marry until he was in his 60s, but Bernard went back east and found a Jewish woman from Pennsylvania, my great-great-grandmother Frances Nusbaum. She was born in Harrisburg, Pennsylvania, in 1845, but by 1860 she and her family had moved to Philadelphia. Bernard and Frances married on March 28, 1865, and my great-grandmother Eva (named Evalynn at birth) was born the following year on May 27, 1866 in Philadelphia. According to the Philadelphia city directories for 1867, Bernard was in business with his Nusbaum in-laws at that time. On August 17, 1867, Bernard and Frances had a second daughter, Florence; the baby only lived five weeks and died on September 26, 1867. She was buried at Mt. Sinai cemetery in Philadelphia, along with many of the Nusbaum family members (and also many of my Cohen relatives). A third child, James Leon Seligman, was born on August 11, 1868, and then another daughter, Minnie, was born on October 31, 1869. All of these children were born in Philadelphia, and Bernard, Frances and the three surviving children are all listed in the 1870 census as living in Philadelphia in the 13th Ward. Bernard is also listed in 1871 in the Philadelphia directory. At some point, however, in 1871, Bernard and Frances and their children relocated to Santa Fe, and their last child, Arthur Seligman, was born on June 14, 1871, in Santa Fe, the first family member to be born in that city. According to Twitchell, Frances Nusbaum Seligman was one of only eight women living in Santa Fe at that time who did not come from a Spanish background. Twitchell described my great-great-grandmother as “a woman of rare beauty, great intelligence and charming personality.” Although I will write about the Nusbaum family at a later time, for now I can say that they were a large and successful Philadelphia family with a German Jewish background; it must have been very difficult for Frances to leave her family behind and move all the way to Santa Fe, a frontier town far different from Philadelphia. My great-grandmother Eva was only five years old when she made that cross-country trip with her parents and her siblings, leaving Philadelphia temporarily behind. She lived there for ten years, and when she was fifteen years old, she returned to Philadelphia for college and married my great-grandfather Emanuel Cohen when she was twenty. She lived in Philadelphia for the rest of her life. But most of the Seligman family developed and maintained deep roots in Santa Fe, ties that still exist today for many of their descendants. In my posts to follow, I will first write about the years that my great-grandmother lived in Santa Fe, 1871-1881, and about her family. Then I will write about the years that followed, including the story of my great-great-uncle Arthur Seligman and his career as a political leader and ultimately governor of New Mexico. “A Good and True Man Called Home,” Santa Fe New Mexican, February 3, 1903. Ralph Emerson Twitchell, Old Santa Fe: The Story of New Mexico’s Ancient Capital (The Rio Grande Press 1925), pp 476-478. I found a few errors in Twitchell’s account of Bernard Seligman, including the birth year of his brother Sigmund and the birth places of his first three children. I cannot independently verify some of his other assertions, unfortunately, but report them here as they were reported in Twitchell’s book. Twitchell, p. 477. It is important to note that there was an entirely separate Seligman family that settled in Bernalillo, New Mexico around the same time that my Seligman ancestors were settling in Santa Fe. As far as I can tell, there is no familial relationship between the two families and the “other” Seligmans came from a different region in Germany, but one never knows. Henry Tobias and Sarah Payne, “Jewish Pioneers of New Mexico: The Seligman Family” (The New Mexico Jewish Historical Society, 2005). Twitchell, p. 477. Bernard’s obituary claimed that he had come to Santa Fe directly after immigrating, but it makes sense that he would have spent some time in the east since he arrived in NY in 1857 and is said to have arrived in Santa Fe in 1858. Also, perhaps it was that initial stay in Philadelphia that caused him to return to Philadelphia some years later and to meet and marry my great-great-grandmother. (Oxford University Press, 1975), pp. 71-73. Parish, p. 15. See also Henry J. Tobias, A History of the Jews of New Mexico (Univ. N. Mex. Press. 1990), p. 40-41. During the Civil War, Bernard served as a captain and quarter master for the Union Army. Arthur Scott, “Seligman Brothers—Pioneer Jewish Entrepreneurs of Santa Fe and the New Mexican Territory,” at http://www.newmexicohistory.org/people/seligman-brothers-pioneer-jewish-entrepreneurs-of-santa-fe-and-the-new-mexi See also Tobias, p. 54. This entry was posted in Gau-Algesheim, Genealogy, Philadelphia, Santa Fe, Seligman/Seligmann and tagged Gau-Algesheim, Germany, New Mexico, Santa Fe, Santa Fe Trail, seligman by Amy. Bookmark the permalink. I’m amazed at how much information you found out about the Seligman brothers. Did you know about the photo of your great-great-grandfather or was that a recent discovery? It’s such a great picture! Well, this was actually one of the easier lines to research since they were so well-known, given that they were early business leaders there and also since Bernard’s son Arthur became the governor. Also, Arthur’s grandson Arthur Seligman Scott had already compiled a great deal, and there were several books and articles that talked about the Seligmans. The picture I had seen before. It appears in several books and websites. It really is a piece of Americana—three Jews in the Wild West with two Indians. It sounds like a Mel Brooks movie, Blazing Saddles! As one of the founders of the Voces de Santa Fe website (and Arthur Scott’s sidekick) I found this fascinating. I’m also intrigued by the possibility that you’re also a relative of Jesse Nusbaum, one of the major photographers of New Mexico from the turn of the century to statehood in 1912. He later went on to become the first superintendent of the newly formed Mesa Verde National Park. Hi Mike, Thanks for stopping by and commenting. Any friend of my cousin Pete is a friend of mine. I have not yet found a connection to Jesse Nusbaum. I know he was born in Greeley, CO, and that his father’s name was Edward Moore Nusbaum, I will look further, but somehow I think it’s unlikely that he was related to the Nusbaums in Philadelphia. But you never know! It looks like Edward Moore Nusbaum was born in Ohio around 1852 and that both of his parents were also born in Ohio, probably in the 1820s or 1830s. It seems quite unlikely that those Nusbaums were related to my ancestors who came to the US in the 1840s and settled in Pennsylvania, but anything is possible! What an amazing story and such a cool photo, Amy! Wow, I’m so impressed with all the work you did here. On another note, did you send me an email yet? Thanks!! And my brain must be fried. Why was I emailing you? So sorry! Too much time hanging out with dead people…. That is pretty hilarious! Yes, you have been! About the lovely nomination. I wanted to talk to you. What an amazing story–I love how you intertwined your family’s history with the larger trends of the times. Beautifully done! Thank you, Pancho! I love researching the history and context of the times when and where my ancestors lived. It helps me imagine the way they lived their lives. Could it be that Sigmund “cooked” two sets of books? Heaven forbid! Hello Amy, my name is Wolfgang Seligmann. I am the son of Walter Seligmann and Herbert was my uncle. I have found your blog while I was searching for some Informations about may family. And for me it is unbelieveable what you have found allready. I am still living near Gau-Algesheim. Please send me an email, so perhabs we could exchange our Informations. I am delighted to hear from you! I will email you.